Summary: Hampered by family secrets, AJ lives in Yellowknife, Northwest Territories with her grandmother while her mother is away at achool getting her teaching degree. When AJ meets a busker named Ed who knows her family and about her mysterious father, she thinks she finally has a way to get her questions answered without having to deal with her grandmother’s stonewalling and her mother’s avoidance of the past. Ed ends up being everything AJ was looking for, a friend as well as a family connection, but all is not as it seems and the resulting drama will unlock secrets AJ never imagined, as well as revealing her true friends. Review: Living in Yellowknife with her grandmother, AJ is having trouble adjusting to living without her mother. She’s having trouble making friends and her limited knowledge about her father continues as both her mother and grandmother refuse to talk about them. Because of their commitment to hiding the truth, Spider’s Song by Anita Daher is a suspenseful thriller featuring personal pain. The pressure of the secrets builds in AJ, leading to her cutting herself in an attempt to release her internal anguish. When Ed comes to town, it seems as though AJ will finally get some answers, although Ed himself is stingy with sharing what he knows. But their relationship grows, and AJ does find out more than she ever knew from her own family about her and her mother’s past. Without saying too much and wrecking the flow, if this story isn’t a cautionary tale about just being honest with your children then I don’t know what is. AJ’s lack of knowledge is directly responsible for the danger she finds herself in, and it all could have been avoided. But if it had been avoided, then there wouldn’t be a story to tell in the first place. I would recommend Spider’s Song to mid teen readers who enjoy a well-written, creepy story that will have you on the edge of your seat. “For teachers who set us on a path. “She rolled her eyes and looked out the window again. 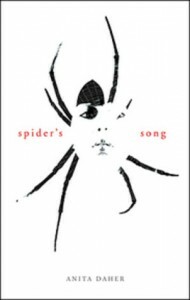 Spider’s Song by Anita Daher is published by Puffin Canada, (2007).